I have been trying to research how to control an IN-13 nixie (datasheet: http://tubehobby.com/datasheets/in13.pdf) using my Arduino Uno. I have bought the HV driver board from eBay and have hooked up the anode to +140V and each cathode to ground. I can see the tube light up at the bottom, but was hoping to test it and see the full display. Because I am nervous of connecting 140V by accident to my Arduino (or across the USB somehow and breaking my iMac) I'd like to ask for a little advice on a simple test circuit to show the bar fully lit, and also another to allow me to control the "bar" on the IN-13 using my Uno. 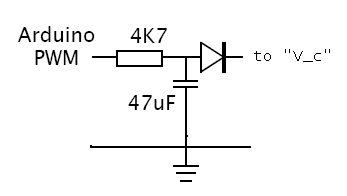 I don't know what transistor it being used (or if this is a safe circuit) and there's no Arduino code. Perhaps someone could kindly help me get started? Thank you for those links. As the IN-13 only has 2 cathodes (indicating / axillary) it seems a little overkill unless I have several tubes being controlled by the Arduino. I'd like to make a VU meter eventually, so would be ideal in this case. Is there a way I can test the IN-13 without using anything apart from the 140V PSU and some resistors? This is an adjustable current regulator. 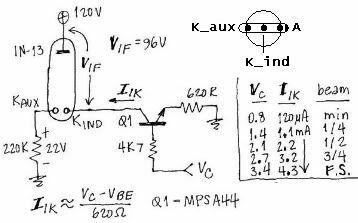 V_c (V_control) is the input voltage. The MPSA44 is a high voltage transistor. Note that a straight "analogWrite"/PWM will not suffice. The PWM must be filtered (smoothed) first. Is this of any use, or will I still need the transistor? Thanks again to you both for the assistance - most appreciated. I had a rummage and noticed that I do have a K155NA1 8910 chip that I think is an equivalent to the SN74141. That IC is for turning on/off segments of Nixie tubes or VFDs. Running the beam in the indicator tube is a different matter. Just a follow up to say thanks to you both. I got the transistors, built the circuit and my tubes light up perfectly. Thanks again for the schematics - much appreciated.